This drawing has now ended. Thanks to all who entered. 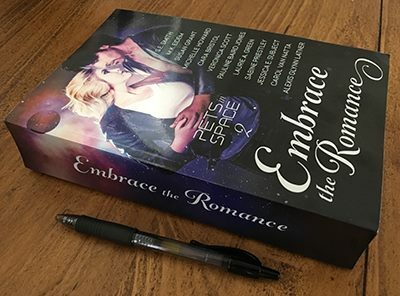 I’m holding a drawing for a PRINT COPY of Embrace the Romance: Pets in Space 2 to be awarded to a random entrant. This volume is a USA TODAY BESTSELLER and offers over 800 pages of exciting science fiction romance adventures…plus cute, smart and resourceful pet sidekicks! PLUS there will be a bonus round! Winners will be selected by a random number generator on November 7th and announced here on the website, on social media and in a special newsletter mailing. Important: Winners must contact me within 5 days to claim a prize or a new winner will be selected, so please make a note to check back on November 7th. You can follow me on social media by clicking the icons near the top of the Home page. To sign up for my newsletter click the box below your comment or use the subscription box on the Home page of this site. Love the drawing and love the second pets in space. They look really good together! Awesome giveaway. I got the Pets in Space books and absolutely love them. In some anthologies you like some of the stories – in these I love them all! Hope you and the others plan more Pets in Space! Animals in stories is my Achilles’ heel, so when I saw the first Pets1 I immediately snapped it up. I’m so glad I did too. You’ve all come up with imaginative stories that I just love. Pets2 is just as awesome! I’ve found some terrific new author’s to love and you can never have too many of those. I hope there is a Pets3 in the future! Thank You for the contest! I would love this in print. Awsome works with the hero dogs. I look forward to reading more of your work. I love anthologies – so many great stories all in one place. Thanks for the chance! Wow it does look huge! Sign me up! Loved the first and am looking forward to the second Pets in Space! love the idea – going into space without our pets would be a horrible future. Besides, like tribbles, they give love! I would love a copy of this book. It was such a good anthology. Thanks to all who have commented (and entered) so far. There’s still time! The drawing is November 7th. Good luck! Saw your giveaway in an email from SE Smith… Thank You for the opportunity! Saw your giveaway in an email from SE Smith. Thank You for the opportunity! Pets in Space sounds so intriguing. Thanks for the chance. I just started reading the anthology and I’m loving it! Thanks for the giveaway. I loved the book. Can’t wait for more. Heard about contest through s.e. smith news letter. Round 2 of Pets in Space, animals or our pets really do bring us together. They love unconditionally, expecting nothing in return but our love. Couldn’t be happier with our furry family members. I heard about this contest from an email newsletter. I have been a fan of yours for awhile now. I love your blog page. I hope I’m not too late! I just heard about this from S.E. Smith’s newsletter! I can’t imagine going anywhere without my cats, even space! An email from S E Smith. I loved the book Pets in Space 2. Thanks for the chance. Thanks for the chance! Great set of books! I heard about this in S.E. Smith’s newsletter today. Thanks to all who have commented so far. Yes, the drawing is tonight, but there’s still time to enter today! I’ll post a comment when the entries close later tonight, so you can keep entering until then. Good luck! Awesome giveaway, thank you for the opportunity to win! I heard about the drawing from S.E. Smith newsletter. Thanks for the chance. I find anthologies to be a great way to discover new favorite authors! Dogs are a gift from Heaven to all of us. I love the concept of Pets in Space! Newsletter. I have discovered new authors that I have emjoyed. SWEET, thanks for the chance! I heard about this drawing through the S.E. Smith newsletter. Writers are awesome! Hear about the drawing through S.E. Smith, SciFi & Fantasy Action Romance. I would really appreciate a tree book version! I heard about the giveaway in Jessica E. Subject’s author newsletter. Thanks so much! The drawing closes in 10 minutes, so if you’re just arriving enter your comment now to be included in the entries! Good luck all! Love the drawings also…and would love to read “Inherit the Wind” as I have both other anthologies, and re-read the first over and over. We’ve had some last minute arrivals, so we’ll leave the comments open until 6:00 PM 11/7/17 real time (that’s 1:00 11/8/17 blog time) — or about another 8 minutes. Last call! Eight minutes until the drawing closes to entries! The drawing is now CLOSED! Thanks to all who entered. We’ll be using Random.org to generate a random number that will correspond to the comment number for both the main print book drawing and the bonus drawing. We’ll be posting results here soon. Embrace the Romance: Pets in Space 2. Bonus drawing for the winners choice of e-books or Amazon e-gift certificate as explained above. Congratulations to you both and thanks to all who entered the drawing. Wow love the drawing id love to win! Thanks for chance! Looking forward to reading “Embrace the Romance: Pets in Space 2.” Thanks for the drawing. If you’re one of the first two to comment below, YOU WIN! The bonus drawing will be for any of the e-items listed in the original post above. Disappointed I missed the giveaway, BUT I loved Embrace the Romance: Pets in Space 2. What country/ time zone is this site using? I had to do a double take when I saw the time stamp said 11-10 3:58am. Thought I fell into a time warp again. 5 hours ahead. Now I have to go look up time zones. Dec, 10: Who Doesn’t Love a Good Sci-Fi T-Shirt? Nov, 28: Need an Escape? Alexisa: Disappointed I missed the giveaway, BUT I loved Embrace the Romance: Pets in Space 2. Jennifer Heinsohn: crossing my fingers! © 2012-2019 Laurie Green. All rights reserved.